When Carrick Felix began his career at Arizona State University, many would have scoffed at the idea of him Felix having a legitimate shot of making it to the NBA. Now, after a rather successful senior season in Tempe –during which he averaged 14.6 points, 8.1 rebounds, and 1.6 assists per game –Felix has a chance to be the most successful Sun Devil prospect since James Harden. Combine his rapid on-court maturation with his impressive combine measurements, it seems as though Felix has as good a chance as any combo guard-forward of finding a home at the next level. One of Felix’s biggest strengths entering the Draft would have to be his physical strength and athleticism. His combine numbers (38.5” max leap and 15 pushups) show that Felix is gifted and ready to play at the next level; he fills out his frame very well, and has shown how to use this combination of size and athleticism. Another strength of Felix’s game has been his maturation. Not only has Felix’s numbers improved from year to year (points, rebounds, steals, blocks, and assists all improved every season), but the rate at which Felix shot the ball also improved (increased field-goal and three-point percentage in every season). A combination of improved statistics and percentages will have teams thinking long-term in regards to Felix continuing to mature at the next level. While Felix has been the epitome of what college basketball should be all about (growing and getting better each and every year, not simply using college as a one-year pit stop), there are many executives who will look at Felix’s overall body of work, compare it to what a premier freshman was able to accomplish in just one season, and pass on Felix. Also, for someone who shot the ball so well last season, it’s a wonder as to why Felix didn’t put up more tremendous, breathtaking numbers; had he averaged closer to 20 points a game rather than 15, many would probably consider Felix a mid-first round pick for this year’s draft. Felix’s primary flaw, though, is his consistency. From early February to early March, Felix couldn’t string together two straight double digit point games. In those single digit games, he didn’t shoot the ball particularly well (8-for-24 in three games), but wasn’t able to make up for it by finding his open teammates either (only 5 assists). Felix has become a very well rounded athlete. He’s shown that he can go back to the drawing board, learn how to adjust to the next level of competition, and make sure he’s taking good shots all-around. However, his slightly older age and inconsistencies will probably alienate Felix from this year’s top crop of shooting guards and guard-forward combos. The real disappointment, though, is the fact that Felix could drop off in most GM’s minds for staying and working on his craft, rather than cutting his education short to try and make more money; granted, Felix’s numbers from previous years would have him go undrafted at best. Time in the D-League seems like the place Felix will spend most of his rookie season, regardless of where he lands. 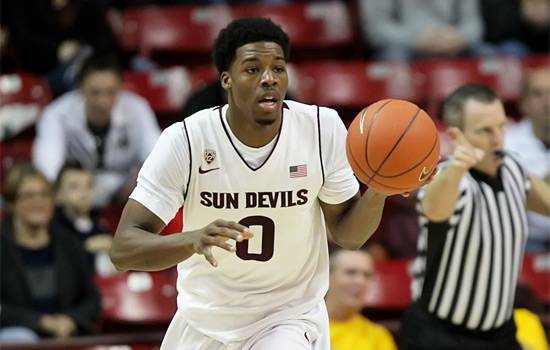 This entry was posted in Home, NBA Draft and tagged 2013 NBA Draft, ASU, basketball, Carrick Felix, james harden, NBA, NBA Draft, nba rookie, NBA Rookie Class, NBA rookies, prospect profile, rookie, sports by NBA Rookie Class. Bookmark the permalink.